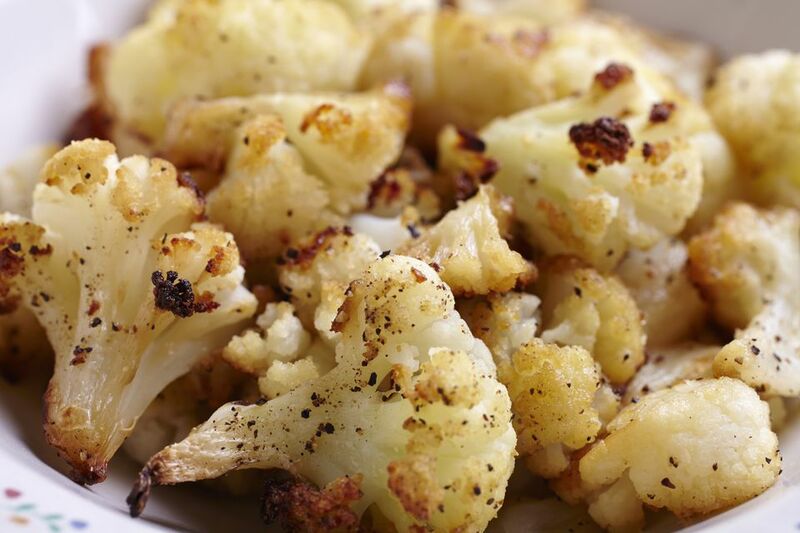 This roasted cauliflower recipe is always a hit because roasting brings out cauliflower's natural sweetness. As the vegetable carmelizes in the oven, it results in a nutty sweetness that tastes much different from raw cauliflower. Lemon juice adds a bit of zing to this recipe, balancing out the mellow garlic and cauliflower combination. It's a super simple recipe that lets the oven do most of the work. Because of that, it's a great dish to have kids help prepare. The more you can get your kids in the kitchen helping, the more likely they are to eat what they made. Help your child use a small paring knife to break apart the cauliflower. If that's too much, they can probably break some pieces off by hand and can help spread the vegetable on the baking sheet. The roasted cauliflower is a versatile dish. You could eat it as is as an accompaniment to any meal. It could also be used as a key ingredient in a grain bowl, fall salad, or tossed with additional toppings like feta cheese, parsley, and roasted walnuts to make into a more complete and complicated side dish. Store any leftover cauliflower in a sealed container in the refrigerator for 4 to 5 days. The cauliflower will lose its crispness, but will still taste good. Cut cauliflower into florets of roughly the same size. Toss with olive oil and garlic. Spread out in an even layer on a sturdy baking sheet. Sprinkle with sea salt. Roast 10 minutes. Turn and roast another 5-15 minutes, until cauliflower is browned and tender when pierced with a fork. The length of time for roasting depends on how big the cauliflower pieces are, how hot the oven is (oven temperatures vary), what type of baking sheet you are using (a cast iron pan will roast quicker than aluminum, for example) and which rack in the oven you are using. Your best bets are to check the cauliflower after 5 minutes on the second side, then continue roasting if necessary. Squeeze lemon juice over cauliflower. Taste, and add salt and pepper, if necessary. Cauliflower is an extremely nutritious vegetable and is a smart addition to any family meal. Cauliflower is a member of the cruciferous vegetable (or Brassicaceae) family along with broccoli, cabbage, kale, Brussels sprouts, and some other less common varieties. Current research findings show that Brassica crops like cauliflower are now highly correlated with preventing chronic diseases including cardiovascular diseases, diabetes, neurodegenerative disorders, and various forms of cancers, just to name a few.